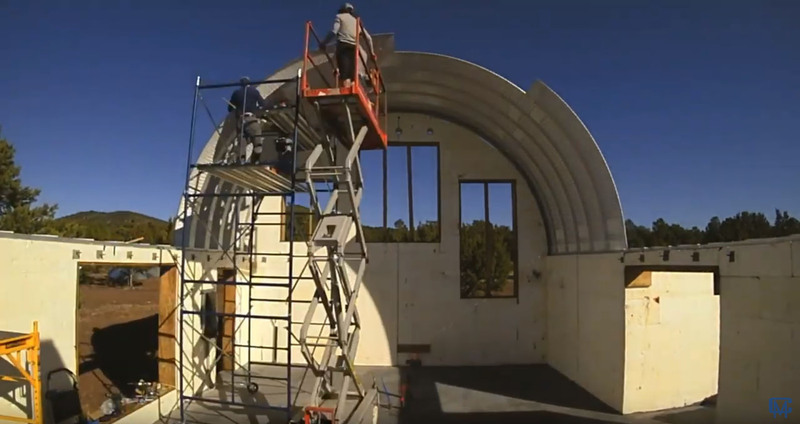 Quonset Hut Guest House: Time Lapse! I love putting together these time lapse videos. The Quonset hut arches look so cool when they just go together fast! We realized later that we didn’t really have any photos of the scissor lift except for what we got on video. Seeing it pop up and down so fast is kind of hilarious in a way; it was actually really tedious at times to position it correctly. Check it out on our YouTube channel and please subscribe if you enjoy it. Do you have an idea for a Quonset hut-related YouTube video you would like to see? Or a subject related to Quonset huts in general or Quonset hut houses in particular? If so, feel free to leave it in the comments below or drop me a line via the Quonset Q&A link up top. Follow our Quonset Hut Home Builds! Laugh with us. Cry with us. Gaze the Arizona night sky with us. Our monthly newsletter will bring all our construction adventures to your inbox: the challenges, anecdotes, wins, and lessons learned as we build our prototype Quonset Hut Houses in northern Arizona, and launch the Quompound as a Grand Canyon vacation rental destination. Unsubscribe any time if it’s not for you. Follow us on Instagram and Facebook. We also have a private Facebook group called DIY Quonset Dwellers, where we share discussion, design, and construction tips with others who are interested in building their own Quonset hut house. With over 800 members and counting, the Facebook group has grown into an amazing resource all of its own. Learn more and request to join the Facebook group here.